As Thanksgiving Break ended, SMU ushered in the holiday season with one of its most beloved annual traditions: the Celebration of Lights. Sponsored by the SMU Student Foundation, the 2017 ceremony took place Monday, Nov. 27, at 7 p.m. on the Main Quad. The ceremony features thousands of decorative lights, luminarias lining the sidewalks, seasonal songs performed by student musicians, and SMU President R. Gerald Turner reading the Christmas Story. The public was invited to attend and to share cookies and hot chocolate with the campus community before the ceremony began. Advent Worship Service: SMU’s Perkins School of Theology celebrates its Advent Worship Service on Thursday, Dec. 7, at 4 p.m. and 8 p.m. in Perkins Chapel. Both services, under the theme “Ero cras…I shall come tomorrow,” will feature the Seminary Singers, directed by Simon Hill ’17 and accompanied by Hannah Cruse. The 8 p.m. service will include a special performance by the Orpheus Chamber Singers, led by founder and Artistic Director Donald Krehbiel ’83. Readers for the service will be Perkins faculty and staff members including Charles L. Aaron, associate director, Intern Program; Carlos F. Cardoza Orlandi, director, Doctor of Ministry Program; Laura Figura, coordinator of student life; Craig C. Hill, dean; Tamara E. Lewis, assistant professor of the history of Christianity; Evelyn Parker, associate dean for academic affairs and Susanna Wesley Centennial Professor of Practical Theology; Margot Perez-Greene, associate dean for enrollment management; and Mark W. Stamm, professor of Christian worship. All-University Holiday Celebration: President and Mrs. Turner invite all SMU faculty and staff members to their annual holiday reception Wednesday, Dec. 13, from 3:30-5 p.m. in the Martha Proctor Mack Ballroom, Umphrey Lee Center. December Commencement Convocation: SMU celebrates its 2017 December Commencement Convocation Saturday, Dec. 16, at 10 a.m. in Moody Coliseum. Retired and current faculty members will assemble for procession in academic dress no later than 9:40 a.m. in the Miller Champions Club. The ceremony will be livestreamed at smu.edu/live beginning at 9:45 a.m.
SMU family members from around the Metroplex and across the country will join their students in celebrating a beloved Hilltop tradition Sept. 23-25, 2016. SMU Family Weekend is coordinated by the Student Foundation‘s Family Weekend Committee. Student research, creativity and innovation will be on display during the Fall 2016 Engaged Learning Symposium and Big iDeas Pitch Contest, scheduled for Friday, Sept. 23 in the Hughes-Trigg Student Center Forum. Engaged Learning Fellows show their work 8:30 a.m.-1:30 p.m., and Pitch Contest teams will hold forth from 2-5 p.m. for the opportunity to win $1,000 in seed money for their projects. Limited quantities of Boulevard BBQ tickets will be on sale at the Friday event from 4:30 to 6:30 p.m. on the Clements Hall South Lawn. Faculty and staff members can claim four free football tickets for the 7 p.m. Battle for the Iron Skillet against TCU at the Ford Stadium ticket window with SMU ID. Tickets may also be purchased by calling 214-768-GAME or by visiting the Athletic Department website. Clear bag policy at Ford Stadium: The only bags permitted on Game Day are those made of clear plastic, vinyl or PVC that do not exceed 12-by-6-by-12 inches; one-gallon clear plastic freezer bags (Ziploc or similar), or small clutch bags (about the size of a hand) with or without a strap. See the complete list of SMU Ford Stadium Game Day policies. Giving back: In keeping with this year’s “Home in the Heart of Texas” theme, the SMU Student Foundation is partnering with Family Gateway, an organization that provides transitional housing and services for homeless families with children in Dallas County. Collection boxes for household items are available in the Hughes-Trigg Student Center and other locations. Parking: On Friday, Sept. 23, Game Day parking is in effect. Please watch your e-mail on Thursday morning and plan to move your car if you usually park near Ford Stadium. Refer to www.smu.edu/athletics for a parking map. 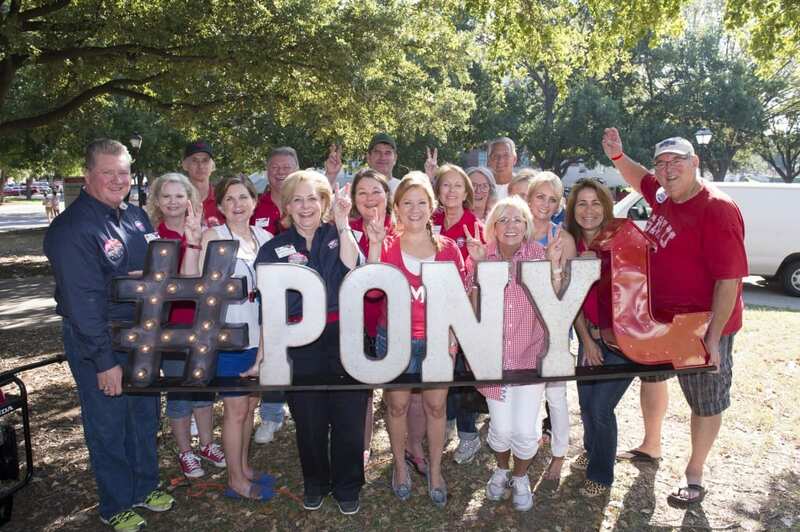 SMU family members from across the country will join their students in celebrating 2015 Family Weekend Oct. 30-Nov. 1. The annual tradition is coordinated by the Student Foundation‘s Family Weekend Committee. For the third year, Student Foundation is partnering with Genesis Women’s Shelter, a Dallas organization devoted to ending domestic violence against women and children. Families and students are encouraged to bring household items to donate. Collection boxes will be available in the Hughes-Trigg Student Center and at other locations. Ticket pickup: Tickets ordered in advance can be picked up from 9 a.m. to 7 p.m. Friday Oct. 30 at the Hughes-Trigg Student Center Crossing, and from noon to 2 p.m. Oct. 31 at the Boulevard BBQ. Family Weekend T-shirts: T-shirts will be sold in limited quantities on a first-come, first-serve basis at the Hughes-Trigg Student Center Crossing during ticket pickup. T-shirts are $10. Parking: On Saturday, Oct. 31, Game Day parking is in effect. Refer to www.smu.edu/athletics for a map. Below are weekend highlights. Find the full schedule here. Engaged Learning Symposium: Stop by the Hughes-Trigg Student Center between 8:30 a.m. and 1 p.m. to listen to students present their achievements in research, service, internships and creative fields. SMU Abroad ‘Get World Ready’: From 10 to 11 a.m. at the Blanton Building, families can learn about SMU Abroad’s 145 programs around the world. Meadows Opera Theatre Opera Free For All: The Meadows Opera Theatre will be performing an assortment of scenes from opera and musical theatre that delve into family dynamics at 1 p.m. in the Bob Hope Lobby. Meet the Faculty: From 2 to 3 p.m. family members can meet Cox School of Business faculty in the Fincher Building; Dedman College faculty in the Dallas Hall Atrium; Lyle School of Engineering faculty in Caruth Hall; Meadows School of the Arts faculty at the Owen Fine Arts Center; and Simmons School of Education and Human Development faculty in Room 144 of Simmons Hall. Big Ideas Pitch Contest: Families are invited to stop by the Hughes-Trigg Student Center Forum between 2 and 5 p.m. to watch students pitch ideas to a panel of judges for a chance to win $1,000. Panhellenic Recruitment Parent Session: This information session from 3 to 4 p.m. in the Hughes-Trigg Theater is for parents of women intending to participate in Panhellenic formal recruitment. Open Houses: Between 3 and 4 p.m., families are invited to the Hegi Family Career Development Center in Hughes-Trigg, Suite 200, and SMU Abroad in the Blanton Building, Room 216. Association of Black Students Fish Fry: From 5 to 6 p.m. at the Hughes-Trigg Varsity, the Association of Black Students invites families to enjoy homemade fried catfish while participating in games with students, faculty and staff. Home Away From Home: Parents are invited to tour their student’s Residential Commons from 5 to 6 p.m. and meet the RAs, Faculty-in-Residence and others who work to make the community a home. Meadows Symphony Orchestra – Sleeper, Szymanowski and Verdi: Families are invited to attend this orchestra performance at 7:30 p.m. in the Caruth Auditorium located in the Owen Arts Center. Tickets to the show are $13 for adults, $10 for seniors, $7 for students, faculty & staff. Talent Show: The 40th Annual Family Weekend Talent Show begins at 8 p.m. in McFarlin Auditorium. Tickets remain available for the Family Weekend Talent Show, while they last, at Family Weekend ticket pickup (9 a.m. to 7 p.m. Oct. 30 at the Hughes-Trigg Student Center Crossing) and at the McFarlin Auditorium Box Office starting at 7 p.m. Oct. 30. Tickets are $10 in advance and $15 at the door. Parent Leadership Council Meeting (current PLC Members only): The meeting welcomes parents of current students who support SMU with annual gifts of $2,500 or more. For more information and to learn about joining the PLC, please contact Christi Contreras at cshelton@smu.edu or 214-768-4746. SMU vs. Tulsa: The game begins at 3 p.m. at Ford Stadium. Football tickets may be purchased by calling 214-768-GAME or by visiting the Athletic Department website. SMU students attend the game for free with their valid SMU Student ID. Meadows Museum Special Exhibition Tours: The Meadows Museum will offer one-hour docent-guided tours of the special exhibition Treasures from the House of Alba: 500 Years of Art and Collecting, at 10:30 and 11:30 a.m. The two tours will be offered on a first-come, first-serve basis. The Museum is open from 10 a.m. to 5 p.m. Tuesdays through Saturdays (until 9 p.m. Thursdays), and 1 to 5 p.m. Sundays. SMU students attend free with a valid SMU ID. CHAS La Familia Luncheon: Families are invited to join the College Hispanic American Students for lunch and entertainment starting at 1 p.m. in the Hughes-Trigg Ballroom. Meadows Symphony Orchestra – Sleeper, Szymanowski and Verdi: Families are invited to attend this orchestra performance at 2:30 p.m. in the Caruth Auditorium located in the Owen Arts Center. Tickets to the show are $13 for adults, $10 for seniors, $7 for students, faculty & staff. Asian Council Family Laser Tag: Enjoy the classic childhood pastime of laser tag with SMU’s Asian Council starting at 6 p.m. in the Dedman Center for Lifetime Sports. To RSVP, please email Eugene Kim at eskim@smu.edu. George W. Bush Presidential Center: At the Bush Presidential Center, families can explore the interactive museum galleries, sit in the Oval Office, enjoy the Texas Rose Garden, eat lunch at Café 43, shop in the Museum store and stroll through the 15-acre park filled with native Texas prairie grasses and wildflowers. The Center is open 9 a.m. to 5 p.m. Mondays through Saturdays, and noon to 5 p.m. Sunday. Tickets can be purchased online; SMU students attend free with a valid SMU ID. It’s that time of the year again: SMU Student Foundation will present Family Weekend 2013 Oct. 4-6. Engaged Learning Student Presentations* will be given during the Fall 2013 Engaged Learning Symposium from 9:30 a.m. to 2 p.m. Students will discuss their research, civic engagement, internship and creative experiences around the world. Hardhat tours of SMU’s new residence halls, set to open in 2014, will be given at 10 a.m. and 11 a.m. The Residential Commons Tour* is free of charge but a ticket is required. The Annual Family Luncheon will be in the HTSC Ballroom at noon. Engaged Learning* is hosting its first-ever Family Weekend Open House from 2-4 p.m. Learn how SMU is shaping world changers through student-developed and -executed individual study projects. The 7th annual Taste of Dallas Dinner begins at 6 p.m. and the 38th Annual Talent Show follows at 8 p.m. Tickets to the show are $10 in advance and $12 at the door. After Boulevarding, head to Ford Stadium for the football game against Rutgers. Kick off is set for 11 a.m. with coverage from ESPNews. The Kappa Alpha Theta chapter of SMU presents Theta Cats Making Tracks 5K*. Join the ladies at 8:30 a.m. for a one-mile fun run or 5k to raise money for their national philanthropy CASA: Court-Appointed Special Advocates. SMU celebrates Catholic Mass at 9 a.m. and All-University Worship at 11 a.m. All services are held at Perkins Chapel. The Meadows Museum is open noon-5 p.m. free of charge for all families and students. Stay updated with everything Family Weekend by connecting with Student Foundation on Facebook, Twitter and Instagram.